Agrotechnomarket.com - National Ag Day is a day to recognize and celebrate the abundance provided by agriculture. Every year, producers, agricultural associations, corporations, universities, government agencies and countless others across America join together to recognize the contributions of agriculture. And in 2018, National Ag Day will be held on March 20, 2018. This is 45th anniversary of National Ag Day, which is celebrated in classrooms and communities across the the world. 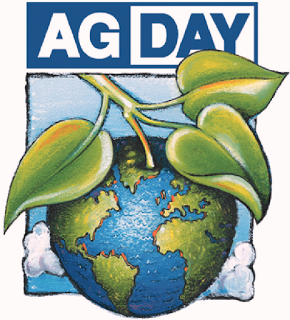 National Ag Day is organized by the Agriculture Council of America (ACA). ACA is a nonprofit organization composed of leaders in the agricultural, food and fiber community, dedicating its efforts to increasing the public's awareness of agriculture's role in modern society. The theme for National Ag Day 2018 is "Agriculture: Food for Life." The Agriculture Council of America will host major events in the nation’s capital on Ag Day, including a breakfast event at the National Press Club as well as a Taste of Agriculture Celebration on the Hill. Additionally, the ACA will bring about 100 college students to Washington to deliver the message of Ag Day. These events honor National Agriculture Day and mark a nationwide effort to tell the true story of American agriculture and remind citizens that agriculture is a part of all of us. A number of producers, agricultural associations, corporations, students and government organizations involved in agriculture are expected to participate. - Understand how food and fiber products are produced. -Appreciate the role agriculture plays in providing safe, abundant and affordable products. -Value the essential role of agriculture in maintaining a strong economy. -Acknowledge and consider career opportunities in the agriculture, food and fiber industry. In addition to the events in Washington, DC on March 20, the ACA will once again feature the Ag Day Essay Contest in addition to an Ag Day Photography Contest. The winning photograph will be part of the 2018 National Ag Day Poster. 0 Response to "National Agriculture Day March 20, 2018"